Our research led MSc in Artificial Intelligence covers the fundamental aspects of traditional symbolic and sub-symbolic aspects. 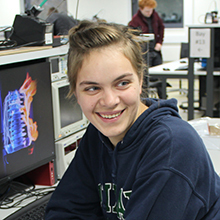 This one year degree offers wide-ranging options including intelligent agents, complexity science, computer vision, robotics and machine learning techniques and helps develop a broad skill set suitable for further study or application development. On this degree, you will learn from world-class researchers working in artificial intelligence fields such as computer vision, evolutionary computing, intelligent agents, game theory, deep learning and other machine learning methods. You will develop core data analysis skills and explore both traditional and state-of-the-art aspects of artificial intelligence and machine learning. The programme is structured well and the lecturers are passionate about their subject matter. This research-led MSc takes a contemporary approach and covers the fundamental aspects of traditional symbolic and sub-symbolic aspects. The programme will give you a solid awareness of the key concepts of artificial intelligence. You will also learn the techniques that form the current basis of machine learning and data mining. You will develop a wide-ranging skill set that supports further study or that you can use in application development. In addition, students may be able to access events and seminars run by the University's Centre for Machine Intelligence. The programme has been designed to maximise student choice by allowing you to tailor the structure to suit your own interests. You can choose areas that reflect your personal interests and work on an individual project. You will however, also take a number of compulsory modules to ensure you are exposed to key topics in all areas. You can apply for the programme through the University of Southampton's online postgraduate application system. Visit how to apply for more information. Please note that we belong to the Faculty of Physical Sciences and Engineering (FPSE). "ECS has great research staff, advanced experimental facilities, and I had such a good supervisor that I decided to stay here to do my PhD in Computer Science"
Our normal entry requirement is an upper second-class honours degree or higher (or equivalent) in a related discipline, such as Computer Science, Programming, Software Engineering, Artificial Intelligence, Maths with Computing. We require a minimum 2:1 degree overall (or equivalent) in a related discipline and 2:1 in the required modules: Linear Algebra (or other Maths modules), and a Programming Language. This programme provides an excellent platform for further research in either industry or academia. 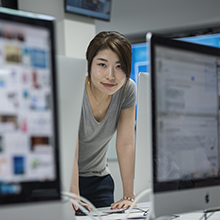 Graduates from our MSc programme are employed worldwide in leading companies at the forefront of technology. ECS runs a dedicated careers hub which is affiliated with over 100 renowned companies like IBM, Arm, Microsoft Research, Imagination Technologies, Nvidia, Samsung and Google to name a few. Visit our careers hub for more information. People on the MSc come from a variety of backgrounds, however you are expected to have some numerate and mathematical ability, and exposure to programming is strongly desirable. Many key modules require some programming aspects and it will help if you are familiar with at least the basics. A useful tool in AI and machine learning is MATLAB, which is a professional mathematical language. It is available at the university, but expensive to buy a single license. We therefore do not expect you to do this, however there is an open source package Octave for which the language and basic functionality is very similar. Some exposure to this before you start may help you out a little in some of the courses (and it is not a bad skill to have in any case! ).